Summary: Site leaders working in rural areas, especially for the first time, will want to read this piece that frames what it means to be a rural teacher, including some of the challenges teachers face in this context and implications for writing project institutes. Visiting and living the rural life for even a few hours helps provide rich context for the work. This is an excellent piece to consider for community building and partnership development. As we climbed into Charlie Latiolais’ boat, I thought how far Catahoula, Louisiana, seemed from that car­peted meeting room in Louisville where twenty-seven NWP site directors had met last November to discuss the feasibility of forming a Rural Sites Network. To our backs was the levee, its high mound of dirt reassuring us that we were safe from the rising waters of the Atchafalaya Basin; in front of us was the marsh, full of cypress trees and willows,most of them still gray from the winter months and the moss that hangs there year round, but some showing patches of yellow-green, marks of spring on this Saturday morning in early March. A half-dozen blue jays complained at Charlie when he started the outboard motor, and then we headed across abroad red-brown canal to his camp where four teacher consultants and I would spend the day conducting inservice for St. Martin Parish teachers.His weathered house, set by itself on a narrow spit of land that rose several feet above the marsh grass, grew larger as we approached it. Its base rested on concrete blocks that would protect it from high water in hurricane season, and on top the tin roof reflected the morning sun like a giant mirror. We knew it would soon be too hot to touch. When we reached the dock, not really a dock at all but a short pier we could climb up on,we could smell the black pots of etouffe cooking before we could see them. Somewhere, we knew, Ti Frere Doucet and Howard Faucheaux were already stirring the roux and chopping the onions and green peppers that would go in before the crawfish. I remembered Louisville. It would be hard to imagine a site much more rural than this one. What did the teachers spending a day at this hunting camp in South Louisiana have in common with those in other rural areas? I wondered. 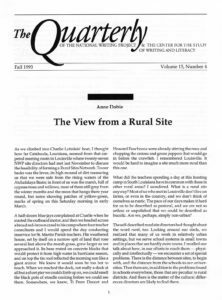 What is a rural site anyway? Most of us who met in Louisville don’t live on farms, or even in the country, and we don’t think of ourselves as rustic. The pace of our days makes it hard for us to be described as pastoral, and we are not so artless or unpolished that we could be described as bucolic. Are we, perhaps, simply non-urban? The self-described rural site directors had thought about the word rural, too. Looking around our circle, we realized that many of us work in relatively urban settings, but we serve school systems in small towns and in places that are hardly even towns. I recalled our talk about how, in our efforts to reach them -physically and intellectually -we encounter a set of special problems. There is the distance between sites, to begin with, and the distance from the schools to our universities. Then there are, in addition to the problems found in schools everywhere, those that are peculiar to rural districts. And there is the matter of the cultural differences directors are likely to find there. Distance, for example, often makes it harder for site directors to attract potential fellows to Summer Institutes. Teachers and administrators who aren’t just “next door” are less likely to be aware of what a site has to offer, or, if they are aware, less enthusiastic to take advantage of it. Getting their attention is not always easy because no explanation need be made for disregarded mailings or unreturned phone calls. Meeting with them personally means going back on the road: more time, more energy. Throughout the ensuing year, distance makes it hard for directors to keep a site’s vitality strong and ongoing. When fellows live in communities spread throughout an area or even a whole state, how can directors provide the post-Institute support that fellows need? How can directors facilitate continuing access to their summer colleagues? Often something as simple as finding an appropriate and convenient place to have regular meetings can become a problem. Even getting together to talk with other site directors can be a rare experience. Separated geographically from NWP colleagues, finding willing listeners and helpful advisers grows harder. Summer fellows can also have problems with distance. Commuting daily across several counties to attend an Institute complicates lives; living away from home for several weeks requires special arrangements. Some times the complexities put a Summer Institute beyond teachers’ reasonable efforts;sometimes they make it an impossible dream. As a consequence, innovative site directors looking for ways to make the Institute more available to teachers from outlying areas are likely to find creative adaptations of the standard NWP model increasingly attractive. More than one site director commented on the difficulty of adhering to the model and being responsive to the needs of rural teachers. Rural teachers deal with complicated situations in their home communities, too. The problems they encounter in their teaching situations are not always unique, of course. Like their urban and suburban colleagues,they have to deal with large classes, non-academic (but school-related) duties, unsupportive administrations, and limited funding.As a result, they are likely to have limited amounts of time and energy for anything outside of what they are already assigned to do. Their morale droops. They grow cynical of trends and “the quick fix.” On the other hand, they too are looking for ways to reach students more effectively. They want to recapture the enthusiasm they had in the early days of their teaching. Some problems seem particularly apparent and pressing in rural areas, however. In Louisville we shared stories about the multicultural populations residing outside of cities. Although attention has been paid to minorities found in urban schools, less has been said about small communities that have significant numbers of Native Americans, Blacks, and other ethnic groups. We talked also about recognizing the rural poor as a minority. Though they are not ethnic minorities, they are often marginalized people whose status creates a strong need to have Projects that can serve their situations. We talked about the cultural differences that often come with physical isolation, differences that pose special difficulties for site directors. Universities, for example, often occupy a strange and somewhat contradictory position in the minds of rural people. On the one hand, institutions of higher education and their representatives are likely to hold a privileged position born of people’s respect for learning and their fond remembrances of their own schooling. On the other hand, sometimes there is also an underlying suspicion, especially on the part of those who have never attended college, about what changes “those professors” are likely to import into their community. School authorities may feel professionally threatened by new ideas or by the fear of having to share control of their teachers. As a consequence, site directors must be sensitive to a wide variety of personalities and issues involving resistance to change, suspicion of “outsiders,” and local politics. Despite this list of problems and difficulties,the discussion in Louisville was no ordinary gripe session. We went on to suggest possible solutions to some of them, even to outline a couple of projects we would like to undertake. Those who met there have received a list of the needs, possible solutions, and projects that were suggested, along with a request to rank them in importance. Recently letters went out to an additional thirty directors whose sites work with rural school districts, inviting them to participate in analyzing our needs and devising ways to meet them. Through The Quarterly we hope to keep everyone, rural and urban, informed about our work. Thinking about these issues as the TCs took the Catahoula teachers through guided imagery and revision techniques, then while we sat in the spring sunshine eating the crawfish etouffe, and later as everyone read from writing just begun, I had, by day’s end, decided that we rural site directors have more in common than I had initially thought. The open spaces of Oklahoma may not look much like the mountains of Appalachia, or like the bayou I crossed to get to Charlie Lationlais’ camp, but we all share problems born of distance, multi-cultural populations, uninformed administrators, cultural isolation, and causes we have not even identified yet. The site directors of the Iowa Writing Project or the Penn Rivers Writing Project will probably never see the principal of Catahoula Elemen­tary fallout of Camille Blanchard’s boat into cold bayou water or watch wild turkeys and an occasional alligator moving about deep in Henderson Swamp, but in ways that count, we are not dissimilar. We share certain identifiable problems and questions. With a network, we will have a means to share our stories about how we solve them.